On April 15, 1912, the RMS Titanic sank into the black waters of the North Atlantic while only 705 survivors watched from tiny lifeboats. Within one hour after the Titanic went down, the RMS Carpathia showed up at the scene, and the survivors were taken on board to warm blankets, coffee, brandy, and the welcoming arms of the crew. After a few hours at the scene, the Carpathia was ready to go, and around them was pieces of wreckage, the seven lifeboats the ship had no room for, plus deck chairs that were floating in the water. When the recovery ship, the Mackay Bennett was dispatched to go pick up the bodies of those that had died on the Titanic, the all-volunteer crew found more than just the dead in the water, but deck chairs, and other wreckage, too. 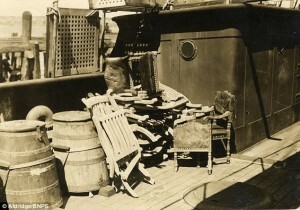 Some of these chairs were picked up, and some other pieces of the ow famous ship too like pieces of the paneling that one crew member carved into a cribbage board. The Mackay Bennett ultimately recovered 356 bodies that they stored on deck, but the ones that were not first or second class, were buried at sea. All together, there are a total of eight Titanic deck chairs that exist, and this one that went up for auction and actually sold. The chair is made of teak wood, but due to its age and condition, no one will ever be able to sit in it again. The chair that went up for auction was one of the Mackey Bennett chairs. Given to a former Mackey Bennett crew member, Captain Julien Lemarteleur, who then passed it on to another collector, who kept it in a nice place where it could look out the window and see the sea. The rare chair has not been sat on since it was back on the RMS Titanic, which makes it more poignant because the last person that sat on this amazing little chair might not have made it off of the Titanic, and died at sea. 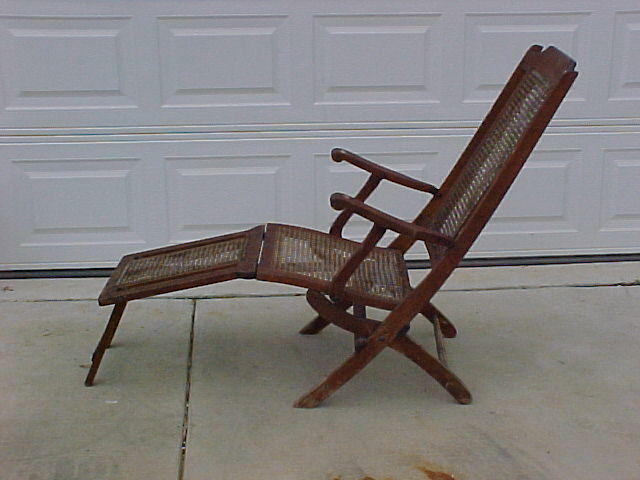 The deck chair went up for auction at Henry Aldridge and Son auction house in Devizes, Wiltshire. The final price for the chair 100 thousand pounds, which is almost $150 thousand US dollars. The question now is what will happen to this rare deck chair? Will the new owner let it be displayed or just keep it hidden? 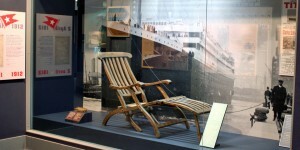 Other than the Titanic deck chair that was just sold, for those enthusiasts that want to see a deck chair, there are some that are on display in museums. There is one deck chair located at the Titanic Historical Society Museum, which is located in Indian Orchard, Massachusetts. 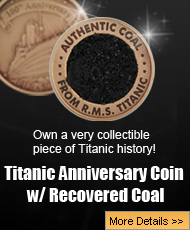 The museum was given this very rare piece of Titanic back in 1980, when the movie, Raise the Titanic was released. The producers of the movie gifted the museum with it, and it certainly is the rarest artifact that the museum owns. Another location of a Titanic deck chair is at the Maritime Museum in Halifax. The chair is on display right next to a giant image of the Titanic. The chair is behind a piece of glass to keep people from touching it. Even though it has been preserved, the wood that the chair is made of is teak, and over the years, it has become very delicate. Also, the wood may be contaminated from the natural oils that people have in their hands. 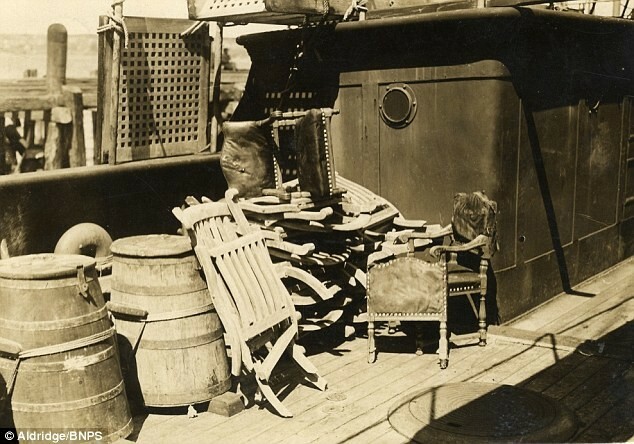 The Titanic went down in 1912, and there were a total of eight deck chairs that were plucked from the ocean when the bodies of its survivors were recovered. One of these eight rare chairs just went up for auction in the United Kingdom, and it sold for $150 thousand dollars. No one knows the fate of this sold chair, but for those that want to see Titanic deck chairs, there are two museums that feature one. The Titanic Historical Society Museum in Indian Orchard, Massachusetts, and the Maritime Museum in Halifax, both have a deck chair. Previous post: Titanic Mystery: What Happened to Her Lifeboats?